The histological characteristics of the primary tumor (i.e., type and grade). Status of cervical lymph nodes. 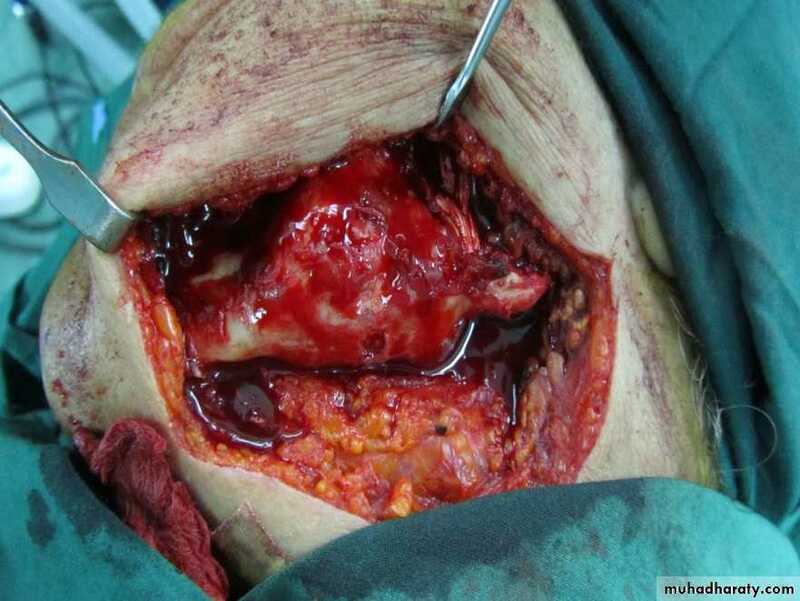 The excision of the lesions should include at least 1 cm of adjacent normal tissues as safe margin. Superficial lesions of the floor of mouth, buccal mucosa and soft palate can be excised through per-oral approach, also T1 and most T2 lesions of the anterior two thirds of the tongue(oral tongue) where the mobility of the tongue is not restricted, and the tumor does not extend to involve the adjacent floor of the mouth or cross the midline are amenable for partial glossectomy through per-oral approach. 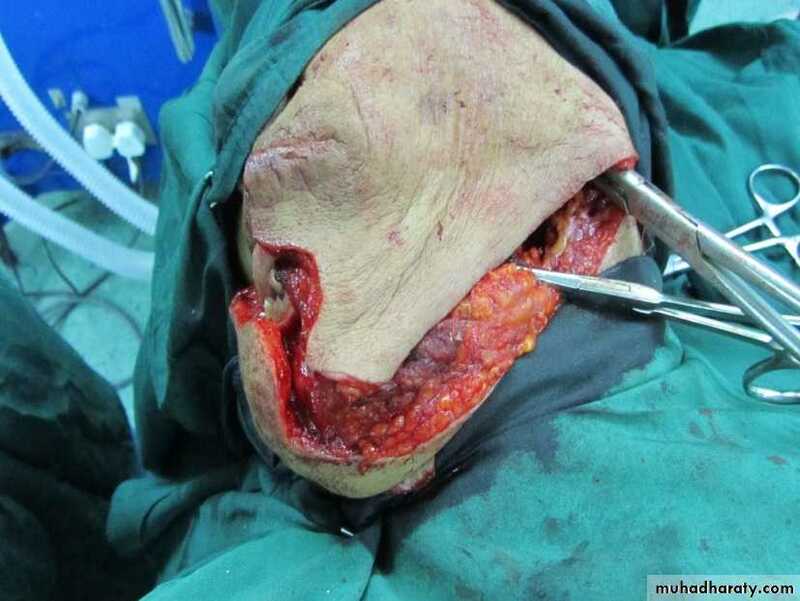 The main surgical approaches are per-oral (trans-oral), mandibulotomy, lower cheek flap approach, visor flap approach, and upper cheek flap approach. It can be safely used for small, anteriorly located, and easily accessible tumors of the oral tongue, floor of mouth, gum, cheek mucosa, and hard or soft palate. 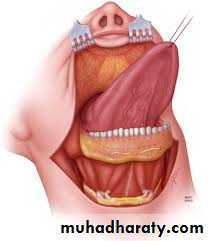 It requires a midline lip-splitting incision that is continued laterally into the neck for exposure and neck dissection. This approach provides excellent exposure for tumors of the oral cavity that are posteriorly situated and not accessible for per-oral approach except those of the upper gum and hard palate. 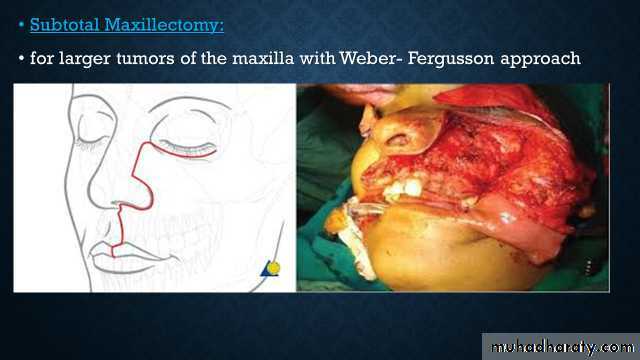 The upper cheek flap approach (the Weber-Ferguson incision and its modifications) is raised using a median upper lip split and carrying the incision around the nose with the corresponding mucosal incision in the upper gingivobuccal sulcus. It is required for resection of larger tumors of the hard palate and upper alveolus, particularly if they are posteriorly located. It provides sufficient exposure for anteriorly located lesions but is not satisfactory for tumors located in the posterior oral cavity. The benefit of this approach is that it avoids a lower lip-splitting incision but produces permanent numbness of the chin because the mental nerves need to be transected for adequate mobilization of the flap. It also may cause sagging of the lower lip and drooling because of a loss of support and sensation. Thus its usefulness is limited. Through bilateral gingivobuccal incisions is preferable in appropriate as this avoids mid-facial scars. 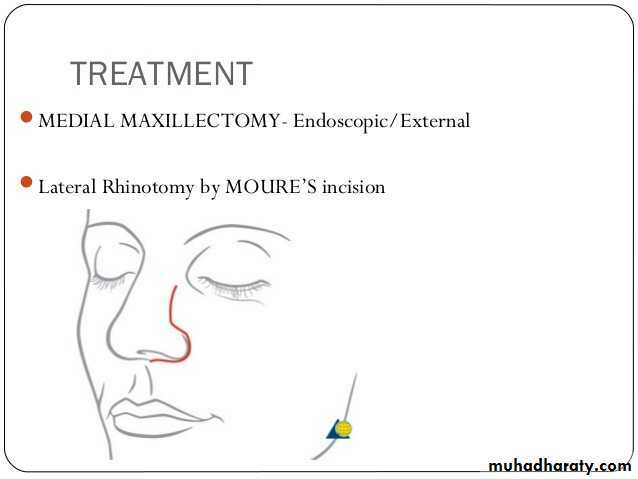 Partial Maxillectomy in malignant tumors of the floor of the maxillary sinus with spread toward the oral cavity or in the early malignant tumors of the maxilla, the procedure is done through the mouth and it requires removal of the lower half of the maxilla. 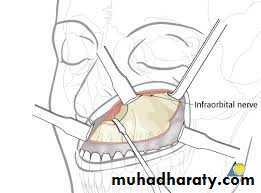 complete removal of the maxilla is necessary when the entire antrum is involved with the tumor and when the tumor extends to the walls of the maxillary Sins. when the tumor extends into the orbit through the orbital periosteum, removal of a functioning eye should only be considered when the chance for curative treatment exists. 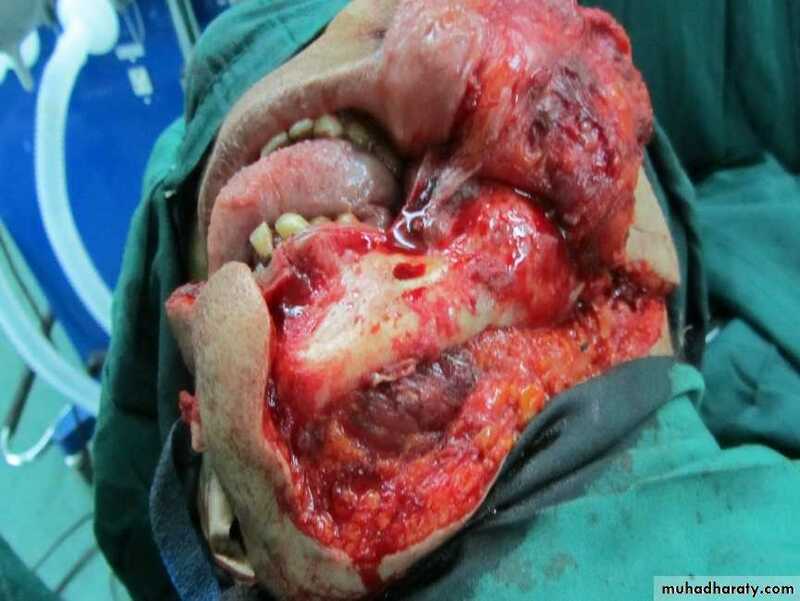 Anterior Craniofacial Resection for tumors that have spread to th anterior cranial fossa. The status of the cervical lymph nodes is the most important prognostic factor in SCC of the head and neck. The overall survival rate decreases by approximately 50% in patients with metastases to the cervical lymph nodes. Approximately 40% of patients will initially be found to have evidence of regional nodal metastasis. Therefore, management of the cervical lymphatics is an important component of them overall treatment of patients with head and neck cancer. The head and neck drain into extensive network of cervical lymphatics, and this drainage pattern usually occurs in a predictable manner for each site. Knowledge of the anatomy of the regional lymphatic system is therefore important for clinicians treating patients with head and neck cancer. 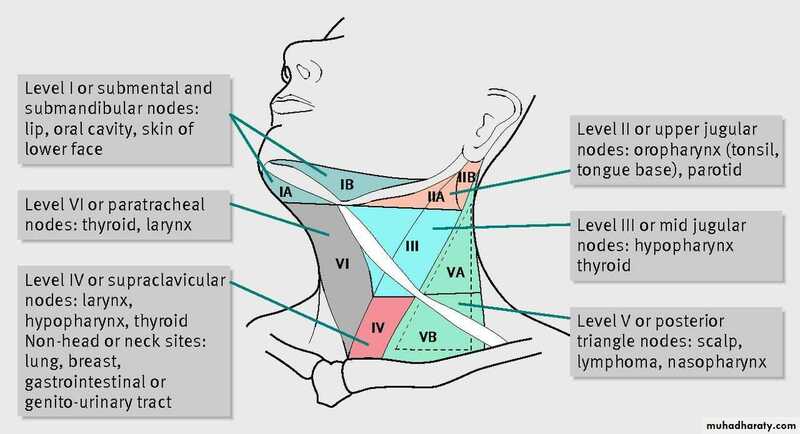 Cervical lymph nodes are categorized into five nodal levels, and additionally levels VI and VII encompassing central compartment and superior mediastinal nodes. Levels I, II, and V are further subdivided into Sublevels A and B. For primary tumors in the oral cavity, the regional lymph nodes at highest risk for early dissemination by metastatic cancer are limited to levels I, II, and II. - Nodal size in excess of 1 cm in diameter. Note: Cervical lymph node size does not always correlate with the presence of tumor involvement. Although larger metastatic lymph nodes indicate greater tumor volume, a small lymph node less than 1 cm in diameter may still harbor foci of tumor cells. Conversely, lymph node size greater than 1 cm in diameter does not automatically herald metastatic cancer, because reactive lymphadenopathy following infection, inflammation, or surgical intervention may result in lymph nodes of such Size. involves the embolic removal of all ipsilateral lymph nodes from levels I through V, along with the ipsilateral spinal accessory nerve (SAN, internal jugular vein IJV), and sternocleidomastoid muscle (SCM. 1. Type I MRND preserves the SAN2. Type II MRND preserves the SAN and IJV3. Type I MRND preserves the SAN, UV, and SCM. 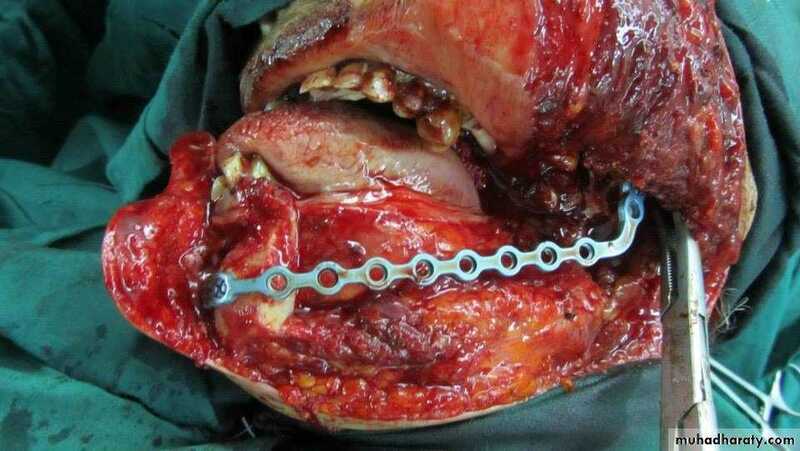 This modification is also termed functional neck dissection. when one or more lymph node groups are preserved during cervical lymphadenectomy that are routinely removed with RND. The lymph node groups that are removed are dependent on the predictable patterns of metastases from the primary site. The levels of lymph nodes removed are identified (e.g., SND levels I to III). when one or more lymph node groups or non lymphatic structures, or both, that are not usually involved in RND are removed. Examples of lymph node groups include the para-pharyngeal, para-tracheal, and superior mediastinal nodes. 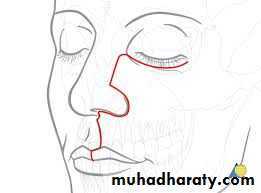 Examples of non-lymphatic structures include the carotid artery, hypoglossal nerve, and para-spinal muscles. Sub classification into "therapeutic" and "elective neck dissection refers to the indication for surgery, but does not specify the extent of the dissection. is used when cervical metastases are detected preoperatively. is used when neck dissection is done for potential subclinical cervical metastases. Studies have demonstrated that occult metastasis Occurs 1n approximately 20-45% of patients who were clinically staged as N 0 . One option is performing elective neck dissection (END) in patients with no clinical evidence of nodal metastases. However, this may lead to 55.80% of patients undergoing unnecessary neck dissections, along with the associated morbidity, particularly postoperative shoulder dysfunction. Various techniques have been used to detect cervical occult metastasis of the clinically negative neck like ultrasound, CT, MRI scans, PET. PET/CT and sentinel lymph node biopsy.